A University of Ulster Telecommunications Professor is to advise the US government on how to develop collaborative research links in science and engineering projects with India. 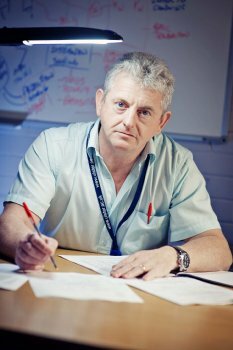 Gerard Parr, Chair of Telecommunications in the School of Computing and Information Engineering, has been invited to speak at a high-powered conference following his success in leading a British-India research partnership. Professor Parr is UK Lead Principal Investigator for a multimillion pound consortium of nine research-leading UK universities and seven of the top research Institutes of Technology in India. The project - which is set to transform the next stage of Internet technology development in both countries. - has been held up as an example of best practice bythe United States Government and its partners. Last month, the project secured a £10 million funding boost from the British and Indian Governments and consortium partners to support the second phase of its research into Next Generation Telecommunications Networks that will support the future Internet. Following the success of the UK India project, Professor Parr has been invited to advise the US government on how to develop Science and Engineering research links with India. The Coleraine based academic is to lead an advisory panel for the US Government through its National Science Foundation (NSF), as part of an initiative to collaborate more closely with the Indian Government and academic partners. He explains: “Globalisation and inter-connectedness mean it is increasingly important for both our research activities and the training of the next-generation of researchers to be international in scope. “The need for international collaboration is perhaps most evident in Information and Communication Technologies (ICT) - in which the USA and the UK are global leaders.The UK government recognises how important research and innovation in Science and Engineering are for economic recovery and other governments around the world are following suit." Professor Parr continued: “The US Government has identified links with India as being of strategic importance for future economic growth. Indeed, two recent NSF-sponsored workshops held in India identified the need for, and importance of, US-India collaborative research in computing and Internet technologies. Collaborative research projects in Pervasive Communications and Computing (PC3) involving Indian and US researchers will be launched later this week (June 14th – 16th 2012)at a major conference in Arlington, Virginia. The conference, which is by invitation only, is funded by theNational Science Foundationand theDepartment of Electronics and Information Technology (DeitY) of the Government of India. Professor Parr was invited in recognition of his outstanding leadership of the UK India project and his growing stature in the international research community. Lead organiser of the Arlington event, Professor Jim Kurose of the University of Massachusetts commented: “Professor Parr’s leadership of the UK India project would clearly indicate that he is the best person to tell our researchers about developing frameworks and mechanisms for international research collaboration with India in Science and Engineering. “Professor Parr said he was honoured to be invited to contribute to such a high profile international event and paid tribute to his UK and Indian colleagues. “I intend to use the event to highlight the work that we are doing and the mechanisms put in place to develop our current project.